Android provides default UI Button for button view.But sometimes we need better UI for application and new colorful button rather than default.so we need to create nice UI for button which looks awesome with application design. First you add button in your xml layout file.Then create xml in drawable folder for button background. in xml drawable file add selector for button. then add item tag for button state.which has different state like state_pressed,state_focused,state_enabled. now create two <item ></item> tag and put condition state_pressed or not. After we can set corner radius for button and when we set radius its looks like rounded box. 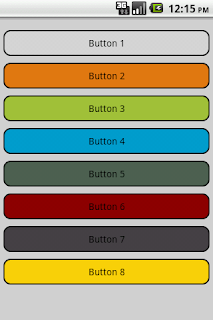 Now we have <solid> tag for button inner color.so you can set color for both state. And the last tag is <stroke> which is used for rounded colorful border.and you can set thickness of border using width and its have color also for colorful border. Now just set your button background in xml layout flie. 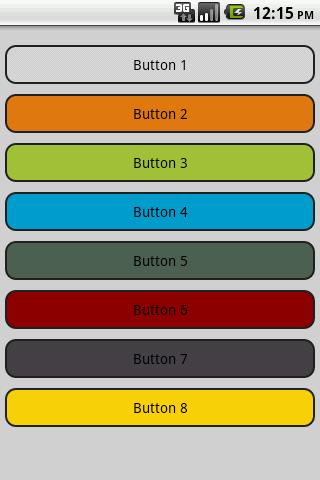 So using below code you can create custom and if you want to set other color select your hex string and past in android:color in solid tag. A community for How Android Forum.This is the forum for help and discussion on Android Development, Galaxy, Nexus, Droid, HTC, IPhone, Media, Carriers, Games, Media, Development, Evo and all your favorites Android phones and tablets. Hi! how about the button text?.. say I have a white button with a black text, and need to have a black button with a white tet onClick/onFocus.. ani thoughts?